Last weekend, I got myself a copy of Castlevania: Lords of Shadow. The game proved hard to put down, intriguing, fast, colorful. It provides a fresh experience that I couldn’t help but think the series needed for a long, long time. As far back as the series’ origins, Castlevania has really struggled to define its soul. The first game consisted of simple action, guiding oneself through castle dungeons and dealing with patterns of monsters. The second game was the first of the series to attempt various RPG and adventure elements. Areas could and would be revisted, several persistent upgrades could be earned. The third game was much like the first, but gave the player the option to choose their own path and, most awesome of all during the NES age, let the player earn three spiritual companions. The companions were basically other playable characters, which with a drastically different playstyle. The three NES games provided a lot of the early gameplay features which have been recycled, improved upon and reused throughout the series for a long, long time. 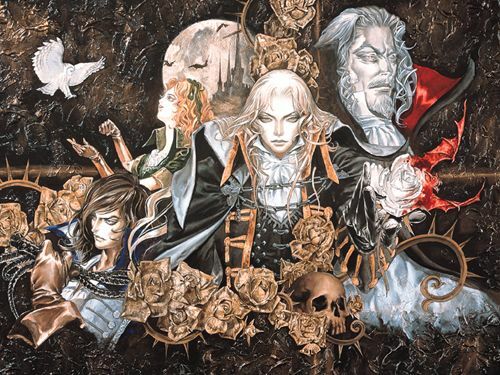 Sometimes, the elements were perfected, as the RPG and adventure elements were in Castlevania: Symphony of the Night. Othertimes, it was good but not great, like Curse of Darkness. One intriguing tradition that has evolved has been the gameplay elements of the characters themselves. When you play as a member of the Belmont clan, you get the fast, twitch action elements you’d expect out of a fighting game. When you play as someone else, like Alucard, the gameplay is more about the explorative adventure and the RPG elements, like gathering items and leveling. But there are lots of changes I like. The story is thick. Previous games either provided simple stories you wanted expanded upon, or tried and didn’t wow, like Lament of Innocence. They draw names from the rest of the universe and try to build upon it. The series transition to 3D over 2D has always been challenging to say the least. SotN resisted the move, remaining an adventurous platformer. The N64 version was the first attempt. Lament of Innocence, Curse of Darkness and Lords of Shadow all did as well, to varying degrees of success. LoS suffers from bad camera angles, but did succeed in implementing various moves and crowd control. Despite the frentic gameplay, you still feel like there are discernable patterns in the attacks of your foes that can be memorized and exploited, just like the very first game. So when I read reviews about how the latest Castlevania game is good but isn’t really Castlevania, I shake my head. The series always, from the beginning, played with its formula and tried new things again and again. It never gave up trying to innovate, trying to grow and expand. I hope in time, gamers will appreciate that. This entry was posted in Game Design, Reviews and tagged Castlevania, Curse of Darkness, game design, game review, Lament of Innocence, Lords of Shadow, monster themes, Simon's Quest, Symphony of the Night, videogames. Bookmark the permalink. I think I bought my first NES just for Castlevania. Castlevania III was my favourite for a long time. I am a fan of the series though I missed out more than a few, the last one I played was Symphony of the Night – I read about the rest after that one but never got to play them properly.